Zambia is an extremely ethnically diverse country, with the Bemba being the largest of its many ethnic groups. 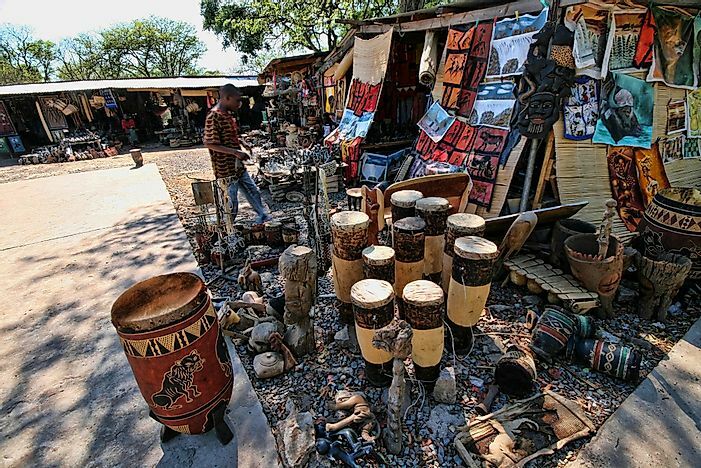 Locally made souvenirs on sale in Victoria Falls, Zambia. Editorial credit: Vladislav T. Jirousek / Shutterstock.com. Zambia is a country in Southern Africa, east of Angola and south of the Democratic Republic of the Congo. It is a landlocked country and borders eight other countries including Angola, Botswana, Democratic Republic of the Congo, Malawi, Mozambique, Namibia, Tanzania, and Zimbabwe. Zambezi River forms a natural border with Zimbabwe, while Lake Kariba on Zimbabwe-Zambia boundary is the world’s largest reservoir by volume holding 180 cubic kilometer (43 Cubic miles) of water. The country has approximately 15 million people comprising about 72 ethnic groups. The Bemba ethnic group constitutes 21% of the total population and they are also referred to as the Babemba meaning the people of Bemba. They trace their origin to the upper Congo basin and are said to have entered Zambia through a mythical land called Kola. Their language of Chibemba is spoken by 33% of the population. They are a matrilineal group who were initially hunters and gatherers but turned to copper mining after the influence of the British who colonized the country. The Tonga ethnic community constitutes 14% of the Zambian population and they are also known as Batonga and live in the Zambezi Valley. The term Tonga means independent which explains their lack of a centralized government. However, there were entitled men among the Batonga known as the sikatongo who were the priest and the ulanyika who were the land owners. The priest was believed to communicate with the spirits and could ask for rain and blessings. The Ulanyika was usually the first settler in the area. They believed they originated from a certain chief Monze who came from heaven and invited Batonga into his chiefdom. Their main economic activity is trade owing to their location which was a major trade center with routes leading all the way to China, India, and the Arabian Peninsula. The Chewa ethnic community makes up 7% of the Zambia’s population. Bachewa is said to have originated from DRC with the Bemba and their language is called Chichewa, and they occupy the southern region of Zambia. Bachewa is divided into two clans namely Phiri and Banda. The Phiri are known to be aristocrats and kings while the Banda are associated with healing and mystics. They differentiate themselves with special tattoos and their religion which is based on Nyau, their secret society. Women are considered special, and the community is matrilineal. The hierarchy comprises of a village headman or woman, Mfumu who answers to a regional chief, Mwini Dziko who in turn answers to the paramount chief. The Lozi ethnic group forms 6% of the Zambia’s population. Their culture is influenced by the flood cycle of the Zambezi River. They celebrate the Kuomboka festival around February or March, during which they migrate from their plain land to higher grounds as a result of the floods. Other ethnic groups in the country include the Nsenga, Tumbuka, Ngoni, Lala, Kaonde, Namwanga, Lunda, Mambwe, Luvale, Lamba, Ushi, Lenje, Bisa, Mbunda among other unspecified groups. The different ethnic communities in Zambia have traditionally lived together in harmony.